Built specifically for 2014-2016 2500HD & 3500HD diesel GM trucks. Basic hand tools are all you’ll need to install your own 100% bolt-on and 100% duty cycle heavy-duty onboard air system that features a 150 PSI high output waterproof air compressor and Model 730 Demon™ spun steel triple train horn. No drilling, cutting or making any vehicle modifications are required. Everything needed comes in one box for a professional & flawless installation. 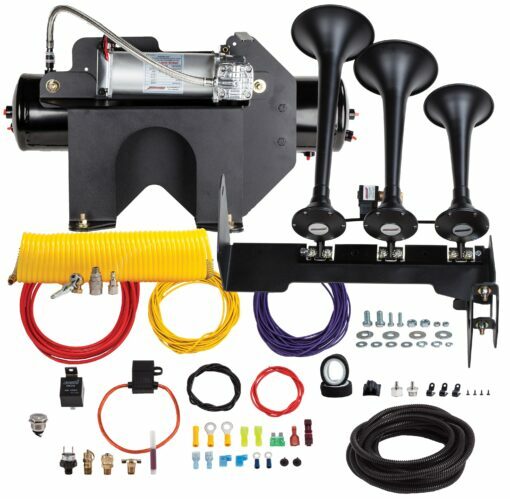 Kit comes complete with vehicle specific direct fit powder coated steel brackets, all necessary hardware, wiring and airline as well as a 30-foot quick connect tire inflator with storage bag. Want it louder? Add the Ultra BlasterMaster™ Valve Upgrade (P/N 6890) to your order. This kit includes two more Vortex 6 all brass solenoid valves, 12 feet of 1/2″ airline and all the necessary fittings to mount a Vortex 6 valve on all three trumpets to deliver the maximum air volume and pressure. Scan down the page for more information. Everything Mounts Under Truck – No Lost Spare Tire or Storage Space! 3-gallon All Steel Air Tank, Manufactured in the USA! Special Note: This product is not compatible with vehicles that have powered retractable steps. Fixed location steps that use the factory mounting brackets are OK.